An Air Canada plane with 332 passengers and 19 crew on board was forced to make an emergency landing after severe turbulence injured 21 passengers, including three children, officials said. Air Canada flight AC88 from Shanghai to Toronto was diverted to Calgary after the turbulence hit. Eight passengers suffered neck and back injuries and 13 more were taken to hospital for observation. The injured were in a stable condition, an emergency services spokesman said. 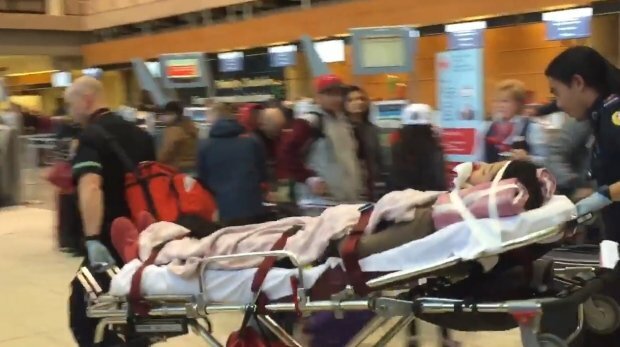 Some passengers were taken off the plane strapped to stretchers. Emergency Medical Services spokesman Stuart Brideaux said the injuries were limited to non-life-threatening neck and back injuries. Air Canada COO Klaus Goersch said the passengers had been through a “very unsettling experience”. He praised the crew’s response and said some of the injured had been quickly discharged. The Boeing 777 landed at Calgary without further incident, the airline said in a statement.